Members of Beth Shoshanna, a Masorti/Conservative Jewish congregation of approximately 30 people, packed up and loaded into a van their Torah scroll and other scripture, as well as other items used for worship and furniture. The move followed a legal fight against the building’s new owners, who are seeking to turn it into a restaurant. “It’s a very heavy feeling that this thing can happen here in 2018,” said Tom Furstenberg, the community’s chairman. 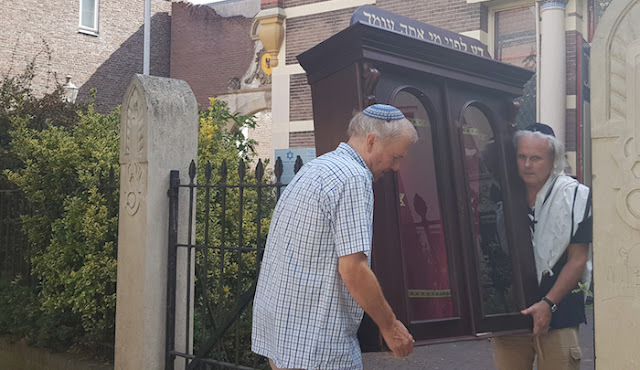 His community had been told to move out by the office of Ayhan Sahin, a Dutch-Turkish developer and owner of several eateries, who in January bought the building housing the Great Synagogue of Deventer with a partner. Last week, the city blocked his plan to open an eatery in the 125-year-old synagogue. But as the owners, Sahin and his associate can still determine who has access to the building and have asked the congregation to move out, according to Sanne Terlouw, a member of the congregation. The community has found a new home in the nearby municipality of Raalte.